If you have ever owned a pair of suede shoes, you will know what an amazing addition it is to your wardrobe. Ever since I first bought a pair of suede shoes, it has been my go-to choice of footwear. This is not surprising, as they are super-comfortable, stylish and pair well with various outfits. With a little care, suede shoes are quite durable and their timeless elegance makes it a classic choice that works for both formal and casual occasions. Despite how beautiful they look, I find it surprising that many people are hesitant to buy suede shoes or use the ones they own frequently. One big concern is their vulnerability to dust, dirt and stains. As a material, suede easily shows scuffs and marks that can tarnish the pristine look instantly. Nonetheless, suede shoes are actually quite easy to maintain. With regular upkeep, you can easily eliminate all surface problems and keep them as good as new for a long time. When you choose suede in your footwear, you have to follow specific care instructions pertaining to this material to avoid damage and improve the longevity of the product. This comprehensive article will look at the following factors that are important in the care and upkeep of suede shoes. Through this comprehensive guide, we will look at how to keep a pair looking their best through daily measures. We will also address potential problems like tough stains or damage that can significantly affect the life of your suede shoes. Instead of directly wearing them all day long, wear them with a pair of socks for short durations of time on a regular basis. This will allow the shoe to expand to fit your feet and there will be no damage to the skin on your feet. You can speed along the process of breaking in, by rubbing the insides of the shoes with rubbing alcohol. This will stretch the suede. Step 3: Your shoes should be comfortable to wear in few days’ time, if you follow the above steps. However, if you continue to feel they are too tight even after a week of use, you may have to take it to a shoe repair shop and get it stretched to fit your size. This video tutorial from EHow beauty demonstrates the process. Suede, being a type of leather, requires special materials and handling for best results. By using the recommended products for care and maintenance, unnecessary damage can be avoided and it will continue to look brand new. Here are the materials and tools required for the care of suede. The structure of suede is such that dust and dirt easily make their way into the pile. Continuous build-up of this nature can damage the fresh look of the material. To avoid this regular brushing of the surface is necessary. Although regular shoe brushes can be used for the purpose, best results are achieved with suede brushes specifically designed for the purpose. These have stiff bristles that will dig into the pile and eliminate dirt. Given the soft nature of the leather, it is prone to wrinkling over time. To retain the original shape and keep the surface smooth throughout, shoe inserts are a valuable tool. After each use, it is a good idea to place shoe inserts in the shoe to restore the original dimensions. When there are scuffs and marks that cannot be rubbed out with the suede brush, an eraser should do the trick. Special suede erasers are designed for this specific purpose. However, similar results can also be achieved using regular shoe erasers. 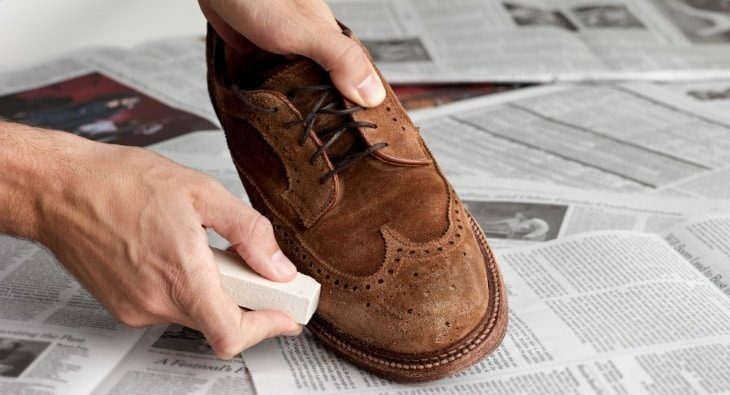 Applying a coat of suede protector spray to the surface of your shoes after it has been cleaned properly will protect it from further stains and marks. With proper care, your suede shoes will last longer and look good. Here is what you should do on a daily basis to ensure this. Before-use care: When slipping on your suede shoes, ensure you use a shoe horn always. This will allow you to slip it on without causing any damage to the lining at the ankle. It will also help to prevent wrinkling of the surface, thus allowing the shoe to retain its shape. The only exception to using a shoe horn is in the case of suede boots, which you can slip into without any external aid. Brush your suede shoes with a rough brush to eliminate any dirt or dust that may have accumulated in the pile. The material can stand vigorous rubbing, and this is the best way to get rid of any buildup that can damage the look over time. A proper suede brush is always better to do the task, than a regular shoe brush. Just as you brush the shoes in the morning, repeat the same process in the evening to get rid of all the dust and dirt that makes its way into the material. Brush vigorously to refresh it and ensure it is cleaned thoroughly. Then leave the shoe in an airy, ventilated area to breathe. This will also get rid of any mushy smells and moisture from sweat. It is a good idea to invest in a pair of shoe-trees that you can insert into the shoes post use, to help it maintain its shape. This will prevent wrinkling of the shoe surface and keep the shape of the shoe for longer. If you will not be using your suede shoes soon again, cover it with a cloth or pack it into a bag to keep it away from dust and environmental factors till its next use. For more information on how to care for your suede shoes regularly, visit this post on the Hanger Project website. Despite how careful you may be with your suede shoes, there are times when stains are inevitable. 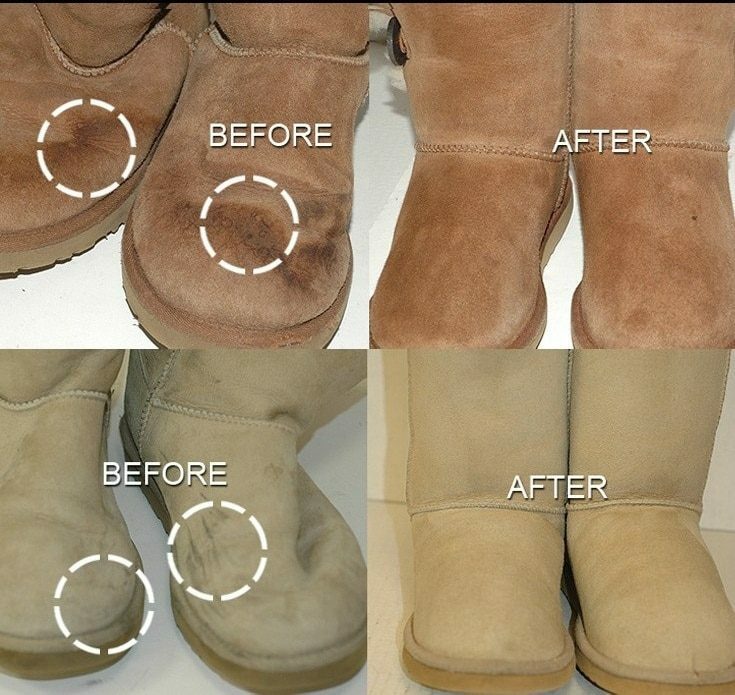 Fortunately, most stains can be eliminated with the proper measures and your shoes restored to their original look. Let us look at some of the most common types of stains and how to get rid of them. Scuffs and marks that cannot be eliminated with rigorous rubbing will require special treatment. Shoe erasers usually can rub these stains out. Special suede erasers are especially suitable for the task, since they eliminate these stains with minimal effort. Simply apply some pressure as you rub hard against the affected area, and the stain should come off. Water stains can cause discoloration of the surface, and have to be tackled promptly. Simply dip a cloth in water and apply it all over the surface of the suede. Once the original mark blends in with the wet surface, use a dry cloth or sponge to remove the excess water. Blot out any remaining water with paper or tissue placed inside the shoe. Dry it well in an airy location. Vinegar is a good solution for stains whose origins are unknown. Simply dab vinegar on the affected area and let it dry. Then brush the area thoroughly. You can also use a scrubber or emery board to rough up the stain and get it out of the shoe. However, be careful not to distress the surface with rough handling, or the damaged look may be impossible to rectify. See how this is done on this video on wikiHow. To minimize the extent of damage to your suede shoes, apply a layer of suede protector spray to the shoes before first use and also after every use. This will create a protective surface that will not stain easily. So, your shoes will be less susceptible to damage and stay refreshed for longer. You should now have all the information you require regarding care for your suede shoes. As I'd mentioned earlier, suede shoes aren't too difficult to care for, when you know what to do. Take care of your shoes on a regular basis, keep it safe from moisture and dust and use it in the right weather conditions. Your suede shoes will then outlive all its counterparts in your wardrobe. Do let us know your comments and don't hesitate to ask any questions you may have remaining. And if you like this article, don't forget to share it with your friends who may also own suede shoes and will benefit from this information.